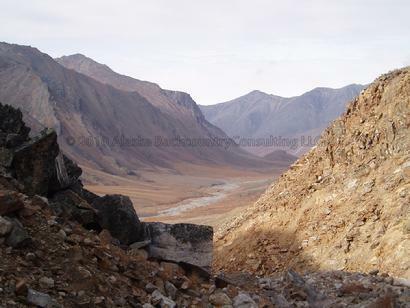 The Brooks Range is the most remote and undeveloped mountain range in Alaska and an ideal location for long term backpacking and river expeditions. The mountains provide superb backpacking amongst showy wildflower blooms, large mammals such as grizzlies and Dall sheep and unique geological features including large areas of limestone unlike most of Alaska's shale-dominated mountain ranges. The mosquitoes are notoriously bad in northern Alaska at certain times of the year so accurate and detailed advice with respect to expedition timing is critical. In addition, there are no facilities, signs or trails in the Brooks Range so local knowledge of exactly where to plan your expedition is key. Free shipping on most orders; Shipping & refund details at bottom of this page. All digital format plans are emailed in Adobe pdf format. For all paper versions of backcountry plans, we offer free domestic USPS Priority Mail shipping with delivery confirmation. For photos and cards we offer free first class postage. Email or call for Express shipping quotes. All international orders may incur extra shipping costs- please email us your city and country for a shipping quote before all international orders. We do not offer refunds once processing of an order has begun for photos, greeting cards or paper backcountry plans. We do not offer refunds on digital plans after they have been emailed. Please see our Terms and Conditions for details.